Space exploitation is flourishing like never before, but new business approaches are crucial to capture the emerging opportunities. 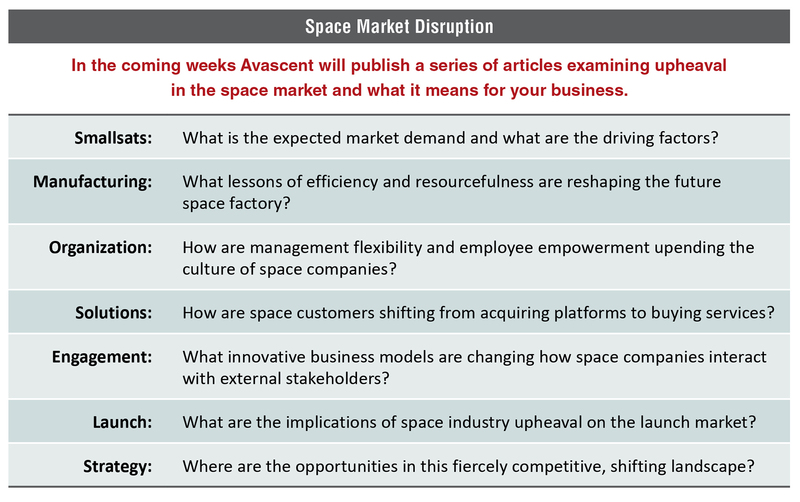 This paper introduces an Avascent series on space disruption and what it means for your company. The life expectancy of companies in the Fortune 500 is now only 15 years, thanks in great part to management that is unable to adapt to external forces. This “creative destruction,” as some observers call it, has only accelerated over time. Nowadays, each year about 10 members in this elite group are acquired and another 15 or so simply fail to keep revenues up with their peers. That means that a decade from now it’s entirely possible half the current Fortune 500 will be gone—this looks especially likely given the increasing globalization of markets and the rapid pace of technology obsolescence. The space industry may be one of the hardest hit by upheaval. Although the changes have been a decade in the making, it suddenly seems as though space has become a viciously competitive industry that upends all previous notions of how to succeed. How do companies that have thrived by selling brilliant but expensive solutions find a role in an environment that now demands solutions that cost one-tenth (or even one-hundredth) as much? The current climate calls for a thorough reinvention of products and services, a creativity and nimbleness not usually associated with aerospace industrial giants. Yet to succeed over the next decade, space companies have no choice but to adapt or die. Change is hitting the industry from all sides, and it’s not just technology that’s advancing, although in many ways it is leading the upheaval. There’s also a transformation in manufacturing systems, business models, customer engagement, and management processes. The space industry is facing such an extreme disruption, in fact, that it was easier for many to spend the past few years in denial—or at least to hope that it would be confined to a few narrow segments. But now, there’s no doubt that these changes are affecting all parts of the value chain and most customer segments. One of the most visible changes is in the explosion of demand for small satellites. New technologies and approaches to space data services are attracting substantial venture capital for new, non-traditional entrants. Just two of the many new startups—Planet Labs and Spire—account for $183 million and $69 million, respectively, in venture capital funding. Google may be thought of primarily as an Internet search company, yet it invested $500 million in acquiring Skybox’s space imagery business and is committing another $1 billion to its new satcom joint venture with SpaceX (in fact, the company is rumored to have set aside up to $15 billion to support development of the business). Now Samsung is looking at funding a 4,200-spacecraft constellation of its own. These technology companies seem poised to reinvent themselves through space. Realistically, there are so many new projects hoping to deploy innovative smallsat technologies, it’s clear they can’t all succeed. But if even a couple of them do, the impact on the space industry will be significant. Much of the innovation affecting the space industry is more fundamental than the advanced systems being launched to orbit, as the space industry is moving to adopt manufacturing and organizational improvements that have revolutionized other industries over the past 30 years. On the manufacturing side, companies are seeing the benefit from “future factory” advances, as they increasingly emphasize efficiency and scalability. Designing products with the complete lifecycle cost in mind—in factories that are highly automated—has become vital to competitive positioning, as this drives down costs. And the new operating philosophy is not confined to manufacturing, as it is also affecting organizational structures, approaches to risk management, employee empowerment, and even corporate vision. Avascent is seeing a holistic approach to business operations that is affecting all aspects of day-to-day decision making. As suppliers are changing their internal operations, they are also reinventing the way that space services are being delivered. Traditionally, aerospace companies built hardware and provided raw data for operator-customers and walked away from the products once they were launched. Increasingly, however, extension into new commercial markets is driving an interest in fielding well-packaged solutions. Less sophisticated customers are seeking end-to-end services that they can buy from providers without getting their hands dirty, and companies are finding ways to meet this demand. As success in commercial markets becomes more evident, government customers are also likely to seek “solutions” approaches to many of their needs. 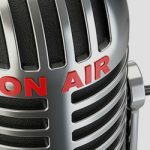 Some satcom and imagery operators are already seeing success by moving in this direction, and it is not farfetched to imagine both weather and positioning and navigation (GPS in the United States) companies gaining similar traction in the near future. Business models are being upended as suppliers are forced to engage with their customers in ways that often entail accepting new risks. More often than not, space companies are expected to make internal investments in non-recurring engineering, an expense that used to be borne by customers. Other customers are seeking co-investment or cost sharing as a prerequisite for winning contracts. Though this is not entirely new (it was a key element in Iridium’s business plan almost two decades ago), it is becoming increasingly commonplace. This means that space companies are incurring more business risk and need to develop the ability to accurately assess the value of these potential partnerships. Most of the disruption discussed so far is directed at space platforms and the services that aerospace companies provide their customers, but it is clear that the space launch market will also be affected. In some ways, innovation has hit the rocket industry first, due to the success of SpaceX and the impact it has had across the industry. New technologies such as all-electric satellite propulsion have altered the procurement of launches, and the ability of SpaceX to offer lower prices has affected how Arianespace and ULA are designing their next-generation vehicles. Yet the new smallsat constellations and business models will also create opportunities for many new, smaller rockets, and competition will be driven by service as much as price. Although most of the innovations in the space industry are being introduced by entrepreneurial space companies, the traditional players are still in the driver’s seat, especially when it comes to fulfilling government requirements. They have decades of experience, deep customer relationships, and the technical expertise to lead change in their respective fields. The traditional firms will need to adopt many of the approaches and innovations introduced by the new generation of companies, yet they have a rich history of success to build upon. Change may be difficult and painful, but it is achievable, and the companies that have led the exploitation of space over the past 50 years are still best positioned to introduce the next generation of platforms and services that will shape the next 20 years—if they are willing to learn from the newcomers.